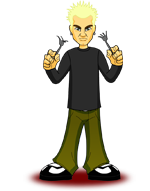 Today, when you order "Liquid Metal Starring Morgan Strebler", you'll instantly be emailed a Penguin Magic gift certificate. You can spend it on anything you like at Penguin, just like cash. Just complete your order as normal, and within seconds you'll get an email with your gift certificate. 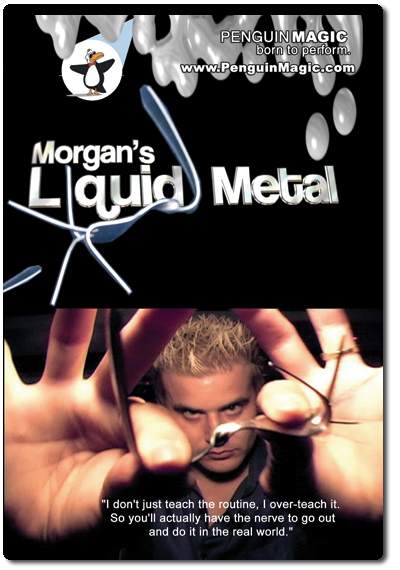 Liquid Metal Starring Morgan Strebler (DVD) The ultimate IN YOUR FACE metal bending routine for EVERYDAY USE! You?re about to learn the most VISUAL metal bending routine in the world. The routine features 2 FORKS and 6 STUNNING PHASES! Each phase builds upon the one before, and at the end the spectator is left with a KILLER SOUVENIR. Special thanks to Banachek for giving permission to include his tine bend and corkscrew bend on this DVD. I bought this last month, and am very pleased with what I got. The teaching on the DVD was awesome, and there was a lot of performance footage, which is always nice. BUT.... This trick is really only for some people. What you need for this routine is #1 large tough hands. The moves themselves require you to have decently strong adult sized hands. If you are a young magician, I would not get it. #2 a large supply of forks. Just for one day of practice, I used 20 forks. You can get them cheap at Walmart, like 5 for a buck. #3 you need patience and the willingness to learn it. The effects of this routine are amazing, but they take a lot of practice. All in all, It is an amazing routine that can be performed nearly anywhere, but it is only for certain people. Thanks! 25 of 25 magicians found this helpful. I almost didn't want to do this review,(selfish motivation) but here goes.I didn't perform this effect for a couple years or so after I mastered it.I just didn't think it would be practical in a real world application.I couldn't have been more wrong. You see, the way I practice is in the street before a real audience made up of people most of which I don't know.I was looking to try something new out for my paid gigs. So I decided to give "liquid Metal" a spin. I hit the pavement, kicked the tires,went from zero to WOW in seconds flat. While I was performing this powerhouse effect this one guy whose eyes had gotten as wide as ping pong balls, grabbed my wrist and asked "Hey man!, are you hypnotizing me!?!"... "I..I..I can't believe I'm seeing this!!!" To which I replied, No sir, it's just good magic. Admittedly, I was just as stunned by the overwhelming reactions as they were with the illusion! I immediately new this pearl would now go into my working repertoire.I did it as a closer in my next paid gig.The spectator I chose actually screamed "OUTRAGEOUS!!!!" and took off running.Contrary to what has been said the explanations are extremely thorough and clear. True it does take a bit of finger strength. As with any effect time, practice, and patience will take care of any obstacles that may arise.So to all my magical peeps, don't sleep on this as I did....don't cheat your specs, treat your specs!! buy!, buy!, and so long too...Layta! 13 of 17 magicians found this helpful. Once you get the moves down this is truly amazing. Timing and creative presentation will take some time to develop. Beginners should expect to do a whole lot of practice. Most of these moves require strength in the fingers. Morgan is great job teaching step-by-step with different angles. This is well worth the cost. I buy virtually every new popular (and sometimes unheard of) effect put out on the market. Liquid Metal stands by itself as the single best trick I own, both from a polished routine perspective as well as audience reaction. After burning through 3,000+ forks, I can assure you - if I only had one trick to perform for the remainder of my life, it would be Liquid Metal. 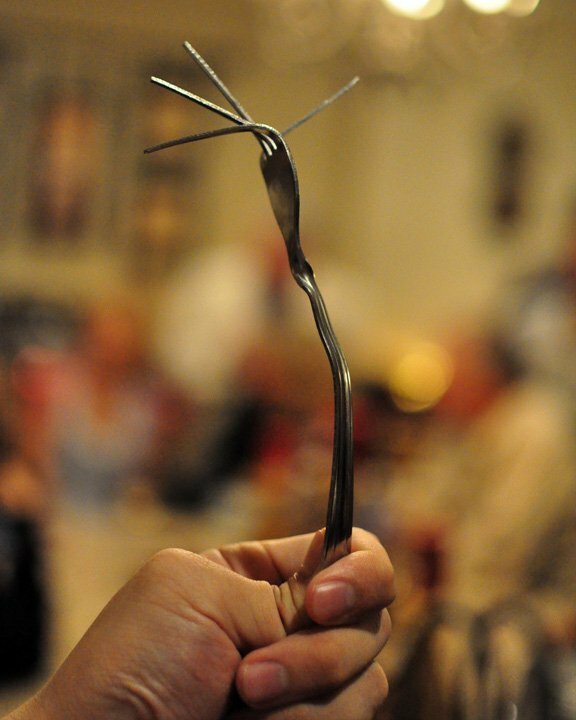 As a working professional and probably one of the better fork bender in my area (I have bent a few thousand forks in the last few years alone), and as someone who does fork bending for all my close up shows, I highly recommend this DVD. I have probably watched and read almost all the major DVDs and books on metal bending I can get my hands on, and I still highly recommend Liquid Metal as the best DVD on the topic. Morgan Strebler's style is strong, in-your-face, and is very practical for close up or walk around. The corkscrew (stem twist) is an absolute reputation killer and is actually what sells this effect. This twist does take a little bit of practice, but it is absolutely worth it. 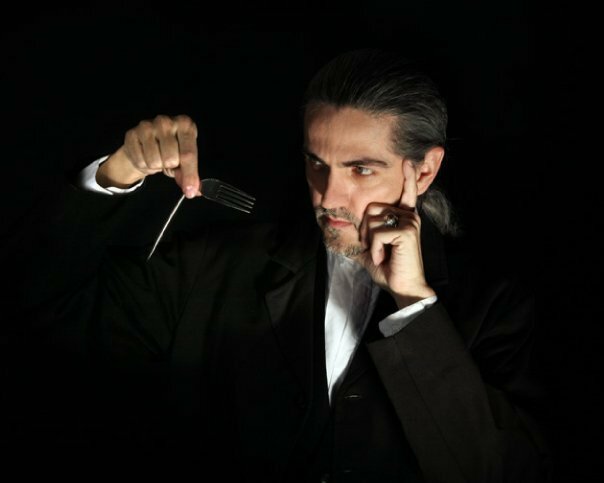 When the audience find out that they cannot twist the stem back, that it is not a gimmicked fork, and that they actually get to keep the fork as a souvenir and therefore not a trick fork, it really blows their minds. Yes... I always get them to sign their names on the fork so that there is no way I could have switch it. 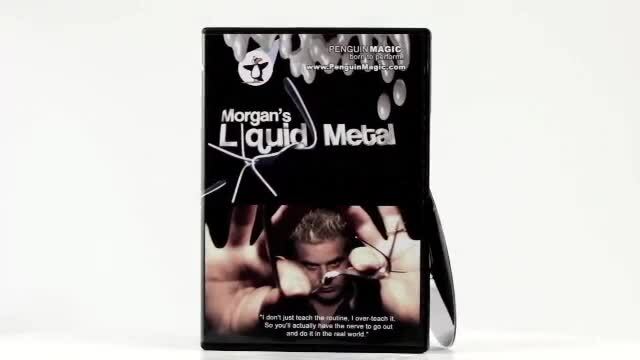 I have built upon Morgan's DVD over the years to developed a personalized fork bending routine that has won me a street magic competition a couple of years ago. My current routine and approach is now very different from Morgan Strebler, but this DVD is foundational to what I perform. The bends in here are exactly what I use in my fork bending routine, even if my approach might be slightly different. If I can give this a 6 star rating, I would. This is one of the DVDs that has really revolutionized my career. Take the time to practice what you learn here. It is worth the effort. Please don't buy this, I don't need any competition. I've been performing Liquid Metal for about 4 years now, and it's one of the most powerful effects I do. The audience reaction is tremendous and it works equally well for all ages. The forks are easily bought through amazon.com, and the practice necessary is worth it. You DON'T have to be a strongman to do it, you just have to practice until you get the feel -- after that, the rest is showmanship and misdirection. If you like to do stunning magic with ordinary objects, this one is a reputation builder. First off, I would like to say that if you are beginner, I might stay away from this for a while. It is going to take a lot of practice and effort to get this right but once you do, you'll have a trick that will leave your audience stunned. The good thing about this video is that Morgan goes into great detail while explaining the method so you won't find yourself rewinding it twenty times before you understand. If you've been doing magic for a while and you are looking for something new and interesting, pick this up and start practicing. He really goes in depth on the teaching so a complete noob can learn this. Be warned. It will take time to build up the strength to bend the silverware. I perform a variation of this in my act EVERY NIGHT I perform. This is one of the most talked about things that I do. I saw Morgan perform this thing live @ Magic Live and, let me tell ya, it blew my mind. And the rumors are true, he is a nice guy too!